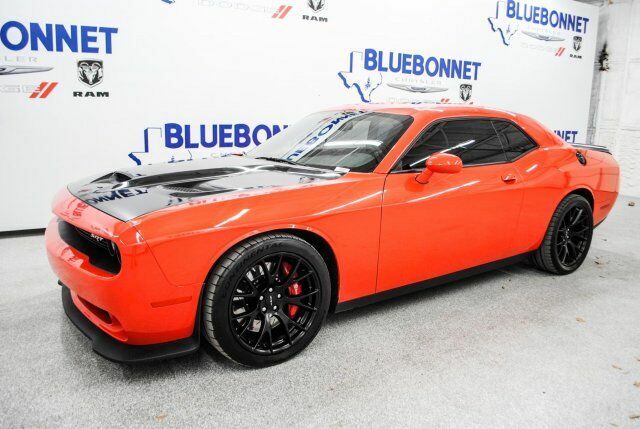 RULE THE ROADS in this Go Mango 2016 Dodge Challenger SRT HELLCAT at a great deal! This awesome coupe is in high demand and comes loaded with gorgeous black leather interior, tinted windows, a sun roof, push start, rear spoiler, hood vents, a touch screen display, MP3, SIRIUS XM radio, UConnect, Navigation, a backup camera, heated power seats, stylish black wheels, & much more! This is a smoke free car & the interior is absolutely free of rips, odors, or abuse. This vehicle's powerful 6.2 LTR V8 Supercharged engine is in perfect working condition for an impressive performance! There are no noticeable dings on the exterior, & the shiny extra clean finish makes this used auto look brand new. The tires have at least 3/4 of their life span left, & the low mileage represented is 100% accurate. With a smooth shifting 8 speed automatic transmission & all power equipment working properly, each ride will be one of excitement & pleasure! If you have any questions about this amazing find or any of our other vehicles, please call our sales office. Thank you for your interest & we look forward to hearing from you. Radio: Uconnect 8.4 NAV NOT AVAILABLE in Dominican Republic or Guam.